Trying to figure out what to do with leftover canned pumpkin post-Thanksgiving? Here’s an easy idea. 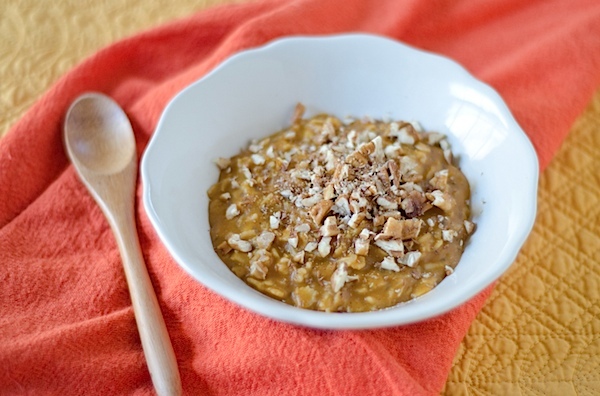 Try this Healthy Pumpkin Pie Oatmeal Recipe. 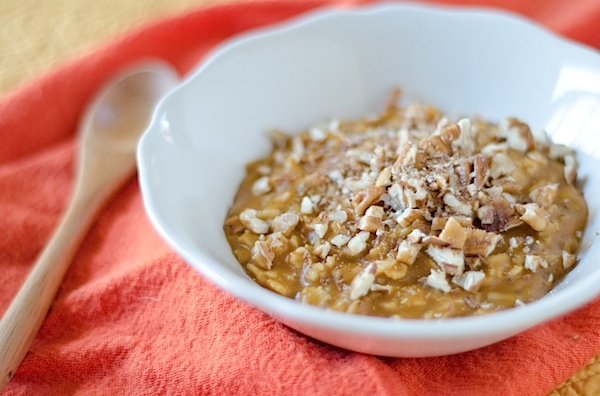 One of my favorite things to do with canned pumpkin is stir it into oatmeal. It adds an easy dose of veggies with little effort. And I think it tastes great, too, especially when you mix it with the right stuff. I know I’ve said that before here on the blog, but I also know there are some new readers here. And, some of my Zumba friends are now checking out TCL, so, I hope long-time readers will pardon the repetition. 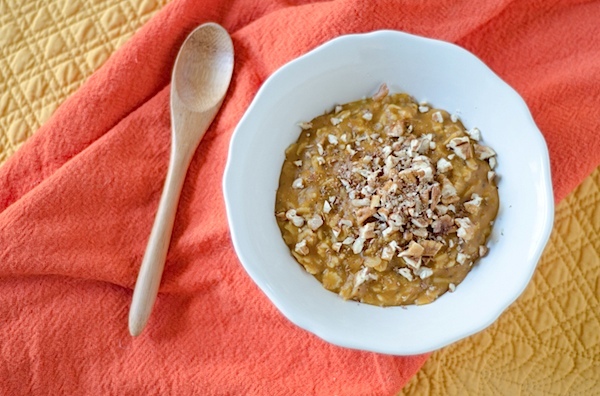 This Healthy Pumpkin Pie Oatmeal Recipe combines some classic pumpkin pie flavors. Since I finally caved this year and bought pumpkin pie spice (instead of just mixing the individual spices together myself), I thought a bowl of oatmeal would be a good way to use up the leftover pumpkin pie spice I didn’t put into the two pumpkin pies I baked last week (vegan tofu and coconut-pumpkin). Maple syrup as the sweetener and a drop of molasses give these oats a rich flavor. And for the new readers – have you guys tried stove-top oats yet? If not, give it a go. It’s so good! I spent the majority of my life making it in the microwave, but stop-top oats are super easy, and I love the finished texture. 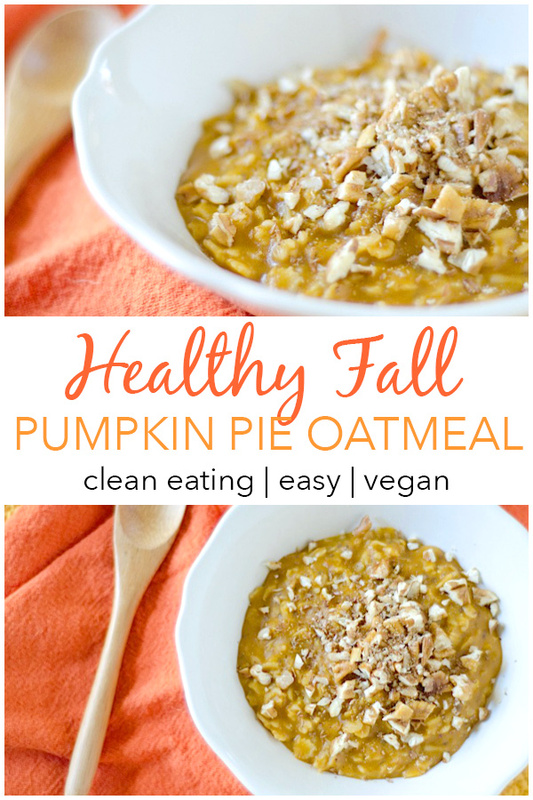 In a small pot, combine oats, milk, water, pumpkin, maple syrup, chia seeds (if using), pumpkin pie spice, and molasses. Stir together and turn heat to medium low. Cook oats, stirring occasionally, until they reach your preferred texture & consistency, about 10 minutes. Note: There are many types of oats – the thicker, the longer they will take to cook. Check the cook time on your package to be more exact on preparation time. Pour oats into a serving bowl and top with pecans and flaxseed (if using). Enjoy! 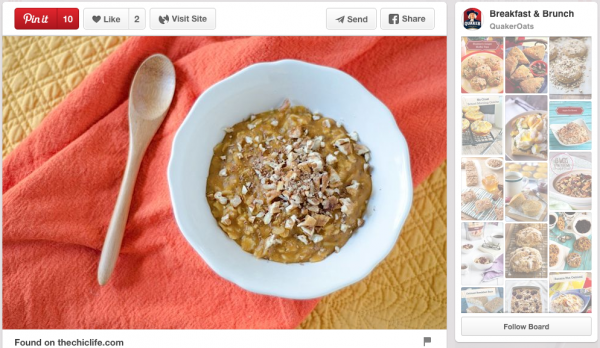 Shout out to Quaker Oats for pinning my Healthy Pumpkin Pie Recipe! Thank you! Click here to view the pin. You get all the flavors of pumpkin pie (okay, except for the graham cracker crust), but in a healthier form with this Healthy Pumpkin Pie Oatmeal Recipe! Want to see more oatmeal concoctions? Then, click the Facebook-like button to let me know. Coming soon to TCL – Click here to check out my first cheesecake recipe (using leftover cranberry sauce! ), brunch at 5 Church, and a new baked doughnut recipe! Thanks for stopping by! Hope you enjoy this Healthy Pumpkin Pie Oatmeal Recipe! Reader question: How do you cook your oatmeal? Stove-top? Microwave? Instant with hot water? Slow cooker? Rice cooker? So many good options! You can cook oatmeal in a rice cooker? I’d try it if our rice cooker wasn’t full of rice 24/7! I have got to open up a can of pumpkin and try all of your pumpkin recipes!